You can find numerous websites on travel writing. But finding the best websites can be a daunting and time consuming task. First, you want websites that will advance your knowledge of freelance travel writing. You want to discover fresh ideas and master new skills. And you want travel writing websites that offer sound advice to freelancers around the world. You also want websites that help you find magazine leads for paid travel assignments. And finally, you’re looking for websites that tell you where press trips are happening. Here are seven hand-picked, highly recommended travel writer’s websites. Our selection criteria included: fresh and interesting information to help you get more writing assignments, earn more money, improve your writing, and connect with DMOs and other people in the travel writing community. I’m obviously biased about this website because I’m the author! PitchTravelWrite is all about marketing and selling your travel stories to print publications. You’ll find plenty of travel writer’s websites that show you how to improve your travel writing. PitchTravelWrite shows you how to sell your stories, because if you can’t sell your articles, you don’t get to write them. When you’re starting out in travel writing you’ll spend most of your time marketing your ideas to editors. This happens to be what I’m really good at. So I share my ideas with you so you can be successful, too. This is the essence of PitchTravelWrite. You’ll learn about the sales pitch - also known as your query letter. But marketing your ideas to publications is about more than just query letters - and you’ll learn about my process that will help you get published more easily and more often. PitchTravelWrite has plenty of information about increasing your bylines on travel websites. And you’ll find advice on how to use your travel writing assignments to land press trips and complimentary travel perks. Travel writers can list their upcoming trips and destinations for potential match-ups with magazine editors. Plus a few other things! I’ve landed several on-board assignments with numerous cruise line magazines through TravMedia.com and scored a few press trips from TravMedia.com announcements. Want to improve your travel writing? Take some courses through travel writing instructor, Nick O’Connell’s, private online school. Seattle travel writer and instructor, Nick O’Connell’s list of bylines is enough to make even the pros drool. He is the author a five books, and his magazine bylines include: Newsweek, Gourmet, Condé Nast Traveler, Saveur, Food and Wine, The Wine Spectator, Outside, GO, National Geographic Adventure, The New York Times, The Wall Street Journal, Commonweal, Alaska Airlines Magazine, Westways, Sierra, and others. These are top shelf glossies, and you’ve got to be an outstanding writer to get published in them. So you’ll be learning from the best. Nick also does a one-day workshop on the essential elements of travel writing alongside our Travel Writing & Marketing Master Class. I sat through Nick’s workshop last April, and it was excellent! Even though I’ve got a long list of bylines and have been published in more than 1000 magazines, I learned some things in Nick’s class. And his advice has rubbed off - I’ve made some fundamental changes to my writing style. Here’s what Nick says about travel writing on his website, TheWritersWorkshop: “Travel writing, Food writing and Wine writing are some of the most appealing genres of nonfiction, calling on all of an author’s skills - dramatic scenes, character sketches, concrete detail, point of view, scene by scene construction - to compose compelling, engaging travel narratives.” It makes the best websites list because it links to high quality writing courses. 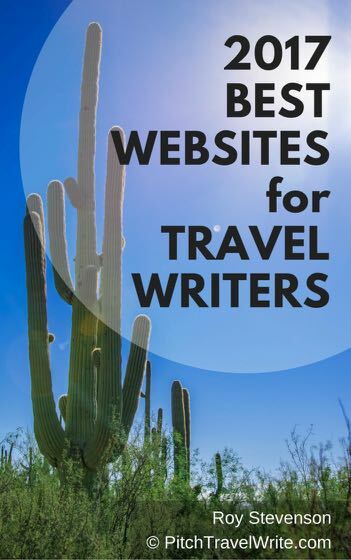 It's on my best websites list because you can learn a lot browsing through TravelWriting2. Former CNN Travel Editor and freelancer, James Durston, has a pithy blog for travel writers & bloggers trying to make their way in the travel writing arena. The articles on TravelWriteEarn are excellent.